I recently had the honor of working with m ss ng p eces and Red Bull Music Academy to document the intimate, closed talks that took place as part of RBMA 2013 in New York City. In a room that held only sixty people, RBMA's journalist and musician interviewers conducted informal talks with some 50 luminaries from all aspects of music production, arrangement, and performance, including Phillip Glass, James Murphy, Lee 'Scratch' Perry, Nigel Godrich, Brian Eno, Debbie Harry, Giorgio Moroder, Q-Tip, El-P, and Rakim. Followup questions after each talk came from not only the RBMA participants but the RBMA studio assistants and staff, including cats the likes of Flying Lotus, Four Tet, Just Blaze, Thundercat, Throwing Snow, Distal, Flako, Koreless, Dorian Concept, Osborne, and Matthew Johnson. As technical director on the project, I saw every second of every session from three angles. While directing camera coverage and editing on the fly and just generally scrutinizing every beat of every interview, I developed an intimate relationship with the material, and formed some strong opinions about what made for an ace talk. Below are my top five from the 2013 academy. All are worth watching, but these stood out to me, each for their own reasons. Take some time to check them out and enjoy the fireworks in your brainpan. Genteel and charming, Giorgio comes across as a man who has made few mistakes and has no regrets. 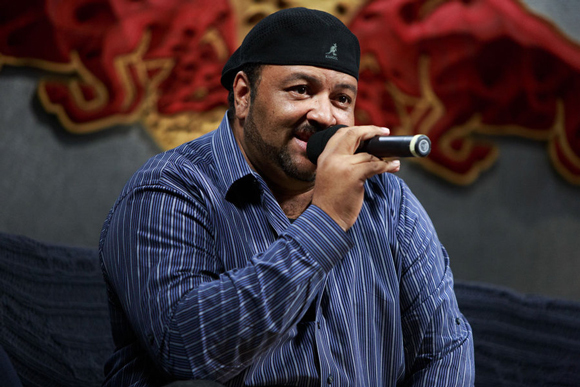 He even says as much in this talk with RBMA founder Torsten Schmidt. Watch if you are a fan of synths, moustaches, Scarface, or Donna Summer. Night Slugs label boss Bok Bok is very deliberately creating something new in UK club music. Through a cultural osmosis he explains to be largely unplanned, he and his labelmates have found a sympathetic aesthetic in what amounts to an uncanny and stripped-down industrial sound made for big systems. Despite being young and of an even younger scene, Bok Bok's thoughts on music and the live music experience closely echo those voiced by many of the more seasoned and legendary producers in this lecture series. 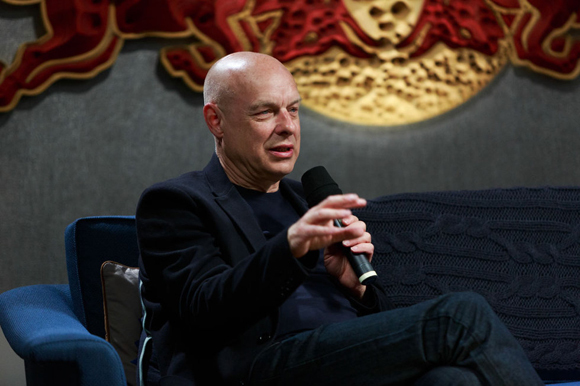 Eno, while arguably among the most famous of the guests on the couch this year, nonetheless demonstrates a self-effacing generosity and enviable present-ness in an easy conversation that spans his entire career to date, including his beginnings in music, his visual work, and his collaborations with others like Bowie, James Blake, and Roxy Music. 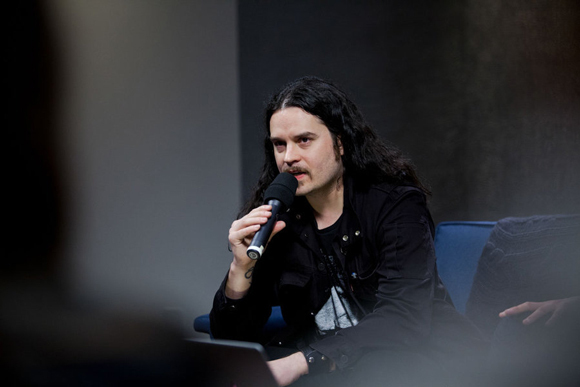 In what amounted to the sleeper hit of the series, Stephen O'Malley's talk opens with playing the entire 19-minute side of his previously-unheard drone metal collaboration with Mika Vainio, and from that place of 'patience and deep listening', may change your perceptions of drone music and metal all at once, as it did for me. Stephen's thoughts on the way time and space shape our perceptions of music are well-formed and thoughtful, giving this talk with RBMA's Todd L. Burns a decidedly academic feel. Strongly recommended viewing for open-minded listeners. I exaggerate not at all when I say this exchange between BBC 1's Benji B and arranger, composer, multi-instrumentalist, and lyricist Van Dyke Parks cracked my brain open and left me feeling intellectually reborn. Parks is best known for his solo work and his collaborations with the Beach Boys - where he arranged and wrote lyrics for their album Smile - but it's command of spoken language and his approach to the world at large, not in the least music, that merits watching and re-watching and re-watching this intensely fascinating conversation. Nothing short of amazing. LA electro pioneer, lothario, and all-around fun guy Egyptian Lover is flat-out hilarious in this one-sided stand-up hour of an interview, in which much of his time is spent trying to get moderator Andrew ‘Noz’ Nosnitsky to blush. although those are the best due in no small part to my crack TD work, moderators Todd L. Burns, Emma Warren, Benji B, Jeff 'Chairman' Mao, Andrew ‘Noz’ Nosnitsky, Davide Bortot, and Torsten Schmidt, as well as Adam McClelland's post team, Owen Katz's production, Willy Friedman's production management, Nico Marti's stage management, and the ace camera stylings of Will Calcutt, Minka Farthing-Kohl, Ben Nicholas, and Brian Lannin.